Most retirees will pay for retirement with Social Security benefits and personal retirement savings they accumulated in 401(k) plans and IRA accounts. A few may have other sources of retirement income such as rental properties or a pension. 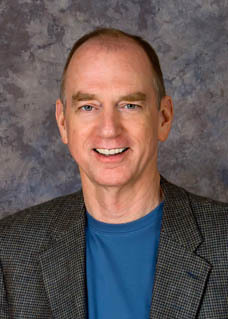 Author and investment adviser, William J. Bernstein, stated in the September 2012 issue of Money magazine that you should save 20 to 25 times your residual living expenses — that is, the yearly shortfall you have to make up after Social Security and any pension. The “shortfall” to which Bernstein refers is the cost of your desired retirement standard of living that Social Security benefits won’t cover. If you need $60,000 a year after you retire to maintain your pre-retirement standard of living and Social Security benefits will provide $20,000, then you have a shortfall of $40,000 that needs to be met from personal retirement savings. If you don’t have enough personal savings to close that gap, your standard of living is going to decline, perhaps dramatically, once you retire. 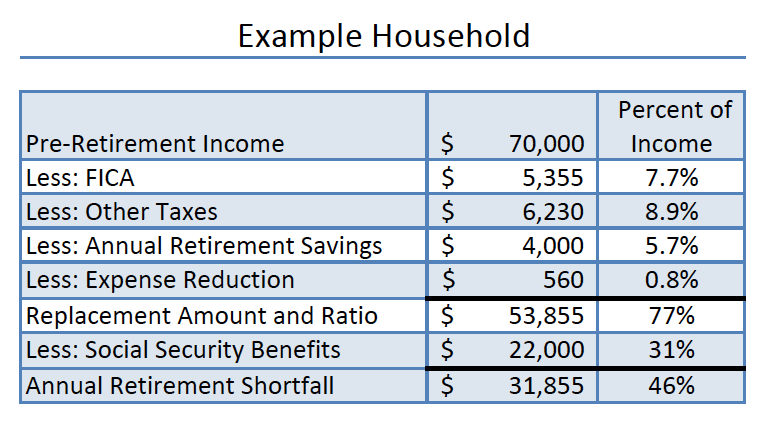 There are four main factors in this equation to calculate the savings we need: taxes, annual retirement savings, expense reductions because you no longer work, and Social Security benefits. Let’s look at them one at a time. The first factor is standard of living. We can start with your household income just before retirement. Let’s say you and your wife earn a combined $70,000 a year and plan to retire next year. After you retire, you will no longer pay FICA taxes. Assume your pay stubs show that your wife pays $2,355 a year in FICA taxes and you pay $3,000, for a combined $5,355. You can subtract this $5,355 from $70,000 because FICA taxes don’t improve your pre-retirement standard of living. Your other federal taxes may decrease, too, along with state and local taxes. You should have your tax advisor calculate these taxes for your household before and after your expected retirement, but a 2008 study by Aon Consulting estimated these for various income ranges. I have included estimates from that report in the table below. The second row shows the percentage of your pre-retirement income you will no longer have to pay in FICA taxes after you retire and the third row shows an estimate of tax reductions in addition to FICA. Data from Aon Consulting Study, 2008. Aon estimates that taxes other than FICA will decrease 8.9% of pre-retirement income, saving $6,230 for a household earning $70,000 a year. Retirement savings fall into the same category. After you retire, you will no longer need to save for retirement, right? Let’s assume you and your wife contribute a total of $4,000 (5.7%) to your company 401(k) plans. I omitted Aon's estimates of retirement savings for the year before you retire because its easy and much more accurate to include your own actual savings rate. If you will save 5% of your pre-retirement income the year before you retire, for example, just add 5% to the percentage in the sixth row and subtract it form the percentage in the bottom row. 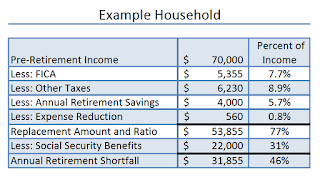 In our example above, if your income is $70,000 and you will save 5.7% of that amount the year before you retire, your Total Cost Reduction in Retirement would be 23% and your Income Replacement Ratio would decrease to 77%. On the other hand, if you were saving nothing for retirement that year, the percentages in the bottom two rows would be correct for your household. In our example, your replacement ratio, or the percentage of your pre-retirement income you must replace after retiring is about 83% if you aren't saving for retirement and about 77% if you are saving 5.7% of your pre-retirement income. Note at this point that nearly all of your cost reductions in retirement come from lower taxes and no longer needing to save for retirement. Only a tiny part has come from the fact that your living expenses decline. After calculating how our cost of living may change after we retire, the next factor in determining how much you need to save for retirement is how large your Social Security retirement benefits will be. You can get an estimate online at http://www.ssa.gov/estimator. Get estimates for both you and your spouse, if married. For our example, let’s say you learn that your combined Social Security benefits for your household will be $22,000 per year. Now, we can calculate your shortfall, or how much of your pre-retirement income won't be covered by Social Security. Subtract the total of your Social Security benefits, or $22,000 in our example (31.4% of your pre-retirement income), from the cost of your after-retirement standard of living, or $53,855 in our example. Your shortfall is $31,900 per year in retirement, or about 46% of your $70,000 per year pre-retirement income. Simply put, that means that you need to come up with an additional $31,900 a year after you retire to avoid a decline in your standard of living. The amount of savings you will need to accumulate to maintain your standard of living after you retire, according to Bernstein, is 20 to 25 times the amount of your shortfall. For our example, you would need savings between $638,000 and $797,500 when you retire. If you want to reverse the math and figure out how much you can spend each year of retirement for a given amount of savings, simply multiply the savings amount by 4% and 5% to get the endpoints of Bernstein’s range. For reasons I will explain elsewhere, I use 4.5%. For example, if you save a million dollars, you can spend about $45,000 a year from savings after you retire, though Bernstein would say you could spend between $40,000 and $50,000. This is precisely the analysis people (and financial experts) need to do. Unfortunately few do. I think that AON underestimates taxes before retirement. I got 9.4% for the feds, not counting state and local - many of which are in the 2-5% range. Aon may be more accurate as I do not include itemized deductions. Most deductions result from mortgage interest - and housing costs/savings are significantly more individualized and complicated. My only real complaint with your example here is the SS calculation. This couple (making 40 and 30 thousand) would likely expect to receive SS benefits of 18K and 16K - a 34 K total - far in excess of the 22K used in the example. According to the benefits estimator at SSA.gov, a man born in 1950 and retiring at 65 after earning $40,000 a year should expect $14,000 a year in retirement benefits ($1,166 per month). In my example, I assume the wife claims spousal benefits. The wife's benefits might, as you suggest, exceed her spousal benefit but we can't know that without knowing her entire earnings history. To your point, I might have made different assumptions in my example and come up with significantly different results, but it's only an example to show how to make the calculation. I think Aon primarily does these calculations to show how replacement rates change year after year on a relative basis. They can't be accurate for everyone so, as you say, everyone needs to do their personal calculation. I'm not big on replacement rates, but they're not bad for a quick analysis on the back on a napkin. I don't know what the SSA calculator does ( I hate using calculators blind) but if a man makes 40K over a lifetime - assuming that his salary follows the national average for wage increases, then 3333 would be his AIME. With Bend Ponts (in 2012) of 767 and 4624 his PIA at FRA would be .9*767 + .32*(3333-767) = 690 + 821 = 1511/month or 18K/yr. His wife's with an AIME of 2500 would claim 15K a year. As I said, this is precisely the analysis that needs be done. But trusting a calculator (even the SSA) without understanding what goes into the calculation is asking for problems. On another note, I have recently begun to read the archives here (you probably guessed that). I think these are some of the best, generally accessible, writings on the subject that I have encountered. I agree and would never recommend people use the Social Security Benefit Estimator for planning. Social Security can also provide an estimate based on your actual earnings. Like I said, it's just an example to show how the math works.